Many Workers Already Have a Standing Desk Called Their Job : Shots - Health News Two-thirds of employed adults stand at work. Many also do physical labor. Among the most demanding occupations: construction, food service and farming. A study published Thursday in the latest issue of the Morbidity and Mortality Weekly Report finds that many U.S. workers are already active on the job. Researchers analyzed the 2015 National Health Interview Survey — the most recent data available — and found that two-thirds of employed adults reported frequent standing at work. Food service workers; employees in farming, fishing and forestry; and cleaning and maintenance staffers were most likely to report frequent standing. Jobs with the least activity were in legal, financial and computational departments. "The big takeaway is just that large differences exist in the prevalence of frequent exertion at work and frequent standing at work," says Taylor Shockey, the lead author of the study and a research fellow at the National Institute for Occupational Safety and Health, part of the Centers for Disease Control and Prevention. Across all industries, education was a major divide, the NIOSH study found. Less than a quarter of adults with a bachelor's degree or higher reported frequent standing and exertion at work. More than half of employees who hadn't gone to college had high-activity jobs. And while many deskbound workers dream of getting up once in a while, standing and physical work come with their own health risks. "The heart has to work a lot harder, the body has to work a lot harder, because you're battling gravity when you are standing up," says Alan Hedge, a human factors and ergonomics researcher at Cornell University. The demands of standing have been linked to varicose veins, fatigue, and feet and back issues. Lifting and twisting can also wreak havoc on an employee's lower back. Hedge points out that the problem isn't necessarily just lifting heavy objects. Small maneuvers, done frequently and repeatedly, can also cause injuries. "The room attendants who clean and make up rooms have to do a lot of lifting," he says. "So every time the company says we're going to add another pillow to the bed, that substantially increases the amount of lifting that people do. And as the size of the bed increases, just lifting up the corner of a king size mattress to tuck a sheet in increases the risk of injury." 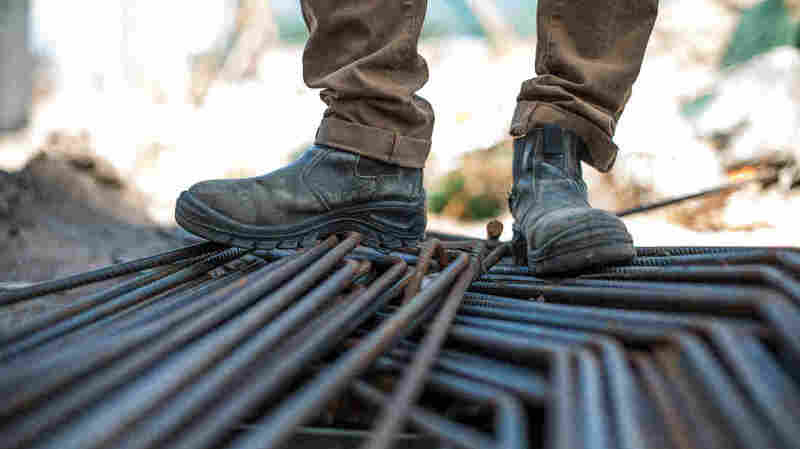 The NIOSH study looked at more than 17,000 respondents to assess trends across jobs and industries, but that's too broad a view to make specific recommendations. "We need to take these results and hone in a bit more to find out how much someone should be standing at their job, how much they should be sitting, how much they should be walking around," Shockey says. Even with more data, many jobs can't easily accommodate a perfect mix of sitting and standing. But there have been efforts to improve conditions for some workers. Last year, California's Supreme Court ruled that all employees are entitled to a seat at work whenever their task can be done sitting down. Employees themselves can prevent some back injuries by working with upright posture, lifting with their legs and building strong core muscles. Taking short breaks can also help. Ultimately, Hedge says, these common sense approaches have been clear since Bernardino Ramazzini wrote De morbis artificum diatriba, the first book on occupational health in 1700. "His conclusion was, if you can mix it up, variety really is a healthy way of working," Hedge says. The hard part, as the past 300 years have shown, is making sure all workers get access to a reasonable balance. A previous version of this story misspelled the surname of Cornell researcher Alan Hedge as Hedges.